Marco Severino first recognized dextrocardia in 1643. More than a century later, Matthew Baillie described the complete mirror-image reversal of the thoracic and abdominal organs in situs inversus. Situs inversus is present in 0.01% of the population. Situs describes the position of the cardiac atria and viscera. 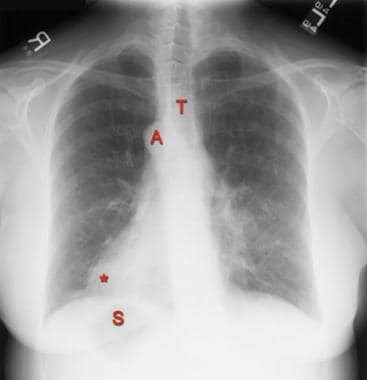 Situs solitus is the normal position, and situs inversus is the mirror image of situs solitus (see the image below). Cardiac situs is determined by the atrial location. In situs inversus, the morphologic right atrium is on the left, and the morphologic left atrium is on the right. The normal pulmonary anatomy is also reversed, so that the left lung has 3 lobes and the right lung has 2 lobes. In addition, the liver and gallbladder are located on the left, whereas the spleen and stomach are located on the right. The remaining internal structures are also a mirror image of the normal. Schematic drawings illustrate the standard anatomy of situs solitus (A) and the mirror image of situs inversus (B). 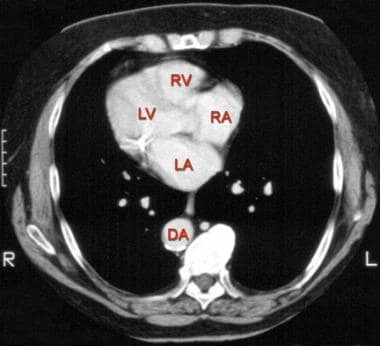 The right lung (RL), left lung (LL), right atrium (RA), and left atrium (LA) are shown. The features of situs ambiguous are inconsistent; therefore, situs ambiguous cases are challenging and require thorough evaluation of the viscera. The location and relationships of the following should be reviewed carefully: abdominal viscera, hepatic veins, superior vena cava, inferior vena cava, coronary sinus, pulmonary veins, cardiac atria, atrioventricular connections and valves, cardiac ventricles, position of the cardiac apex, and aortic arch and great vessels. The recognition of situs inversus is important for preventing surgical mishaps that result from the failure to recognize reversed anatomy or an atypical history. For example, in a patient with situs inversus, cholecystitis typically causes left upper quadrant pain, and appendicitis causes left lower quadrant pain. A trauma patient with evidence of external trauma over the ninth to eleventh ribs on the right side is at risk for splenic injury. If surgery is planned on the basis of radiographic findings in a patient with situs inversus, the surgeon should pay careful attention to image labeling to avoid errors such as a right thoracotomy for a left lung nodule. Situs abnormalities may be recognized first by using radiography or ultrasonography. [2, 13, 14, 15, 16, 17] However, computed tomography (CT) scanning is the preferred examination for the definitive diagnosis of situs inversus with dextrocardia. CT scanning provides good anatomic detail for confirming visceral organ position, cardiac apical position, and great vessel branching. Magnetic resonance imaging (MRI) is usually reserved for difficult cases or for patients with associated cardiac anomalies. [17, 18, 19, 20, 21, 22] Most patients with situs inversus with levocardia require additional imaging to evaluate the associated cardiac anomalies. When radiation exposure is a concern, MRI or ultrasonography may be preferred. The differential diagnosis includes appendicitis, asplenia/polysplenia, congenital coronary abnormalities, sinusitis, and ventricular septal defect. Other conditions to be considered are PCD, heterotaxy (see Heterotaxy Syndrome and Primary Ciliary Dyskinesia), left isomerism (ie, Ivemark syndrome) (see Asplenia/Polysplenia), right isomerism (ie, asplenia syndrome) (see Asplenia), situs solitus, and transposition of the great arteries. If radiologic intervention is to be performed in a patient with situs inversus, the condition should be known from earlier diagnostic imaging. A question of improper image labeling must be resolved before any procedure is initiated. Failure to recognize situs inversus before performing a radiologic procedure may result in intervention on the incorrect side of the patient. Attention to the left and right sides of the patient and the left and right labeling of images is helpful to prevent mistakes in diagnosis and/or surgical intervention. Discordance between the direction of the cardiac apex and the abdominal situs suggests congenital heart disease. Situs ambiguous and situs inversus with levocardia have this discordance between the direction of the cardiac apex and the abdominal situs; thus, further imaging is usually needed. 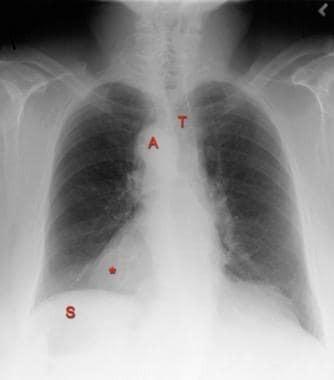 In most patients with situs inversus, chest radiography shows dextrocardia, with the cardiac apex pointing to the right and the aortic arch and stomach bubble located on the right as well. Posteroanterior chest radiograph in a 40-year-old man with situs inversus and dextrocardia. This image shows that the cardiac apex (*) points to the right. A right-sided aortic arch (A) is associated with slight deviation of the trachea (T) to the left. The stomach (S) bubble is visible in the right upper quadrant. Confirming a mirror-image position of the atria allows confident diagnosis of situs inversus if the viscera are also reversed. The atrial morphology cannot be discerned on chest radiographs, but it can be determined indirectly by evaluating the bronchi. In almost every patient, the side of the morphologic bronchus corresponds to the side of the morphologic atrium; therefore, situs inversus is confirmed if the bronchus intermedius is on the left, because the morphologic right atrium is also on the left. If a minor fissure can be identified, by inference, an eparterial bronchus and morphologic right atrium exist on that side. In situs inversus, the longer hyparterial bronchus is on the right side and passes under the pulmonary artery; the shorter eparterial bronchus is on the left side and passes over the pulmonary artery. A left bronchus and right bronchus of equal length suggests isomerism. 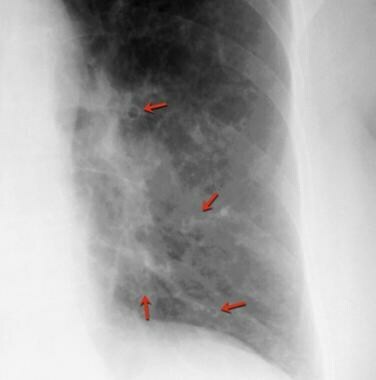 Because 1 in 5 patients with situs inversus have Kartagener syndrome, evaluate the chest radiographs carefully for evidence of bronchiectasis (see the images below). Posteroanterior chest radiograph in a 55-year-old woman with Kartagener syndrome and situs inversus. This image shows a right-sided aortic arch (A) with slight leftward deviation of the trachea (T), dextrocardia (*), and a stomach bubble (S) in the right upper quadrant of the abdomen. Subtle bronchiectasis is also present in the lung bases (see the next image). Magnified view of the left lower lobe in a 55-year-old woman with Kartagener syndrome and situs inversus (same patient as in previous image). 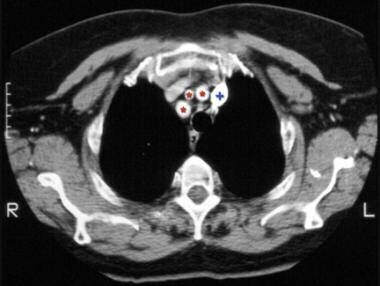 This image shows bronchiectasis (arrows). Upper and lower gastrointestinal examinations are usually not performed for the diagnosis of situs inversus. However, situs inversus may be found incidentally during such examinations. In an upper gastrointestinal examination in a patient with situs inversus, the stomach is on the right, with the C loop of the duodenum curving to the left. The liver and spleen are also in mirror-image locations compared with their normal position. In a barium enema examination, the sigmoid colon curves to the right, leading to a right-sided descending colon and terminating in a left-sided cecum (see the images below). Radiograph of the upper abdomen from a barium enema examination in a 40-year-old man with situs inversus and dextrocardia. 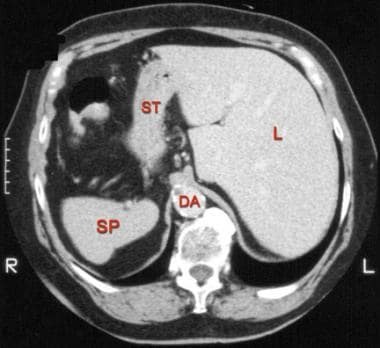 This image shows the liver (L) in the left upper quadrant of the abdomen. 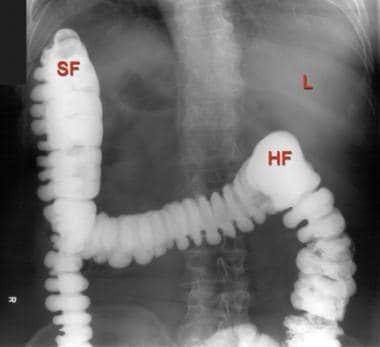 The positions of the splenic flexure (SF) and hepatic flexure (HF) are reversed. Radiograph of the lower abdomen from a barium enema examination in a 40-year-old man with situs inversus and dextrocardia. 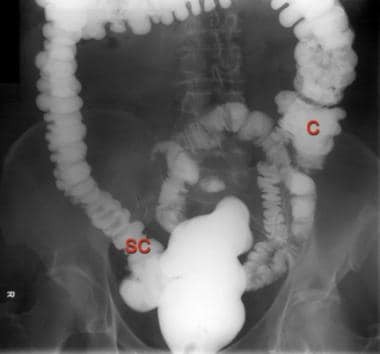 This image shows the sigmoid colon (SC) on the right and the cecum (C) on the left. The degree of confidence of radiographs is high. CT scan findings can be used to resolve any remaining questions. The most common cause of false-positive results is the technologist's or radiologist's inattention to proper labeling. This problem occasionally occurs when a technologist prepares for posteroanterior imaging of the chest and labels the image, but the patient is then seated and imaged in an anteroposterior projection (eg, because of patient debility); as a result, the correct labeling is reversed. The most common cause of a false-negative diagnosis of situs inversus also results from inattention to labeling. The technologist may incorrectly revise a properly labeled radiograph in a patient with situs inversus, because the anatomy is reversed compared with the normal anatomy. A radiologist may incorrectly display an image so that it fits a mental template of what is normal without consciously noting the left or right marker. If a question of proper labeling exists, consult the technologist. If the projection of the image is known, the positioning of the name blocker can usually be used to reconstruct the correct labeling of the image. Alternatively, radiography may be repeated with supervision or special instructions to verify correct left-sided and right-sided labeling. Most fluoroscopic machines have a button that electronically reverses the image. An experienced radiologist recognizes this reversal as soon as the table is moved to the left or right, because the expected direction of table travel is opposite to that observed on the image intensifier. An inexperienced operator can be confused by this apparent reversal of normal anatomy. Conceivably, a patient with situs inversus can be examined with a fluoroscopy machine, and the image can be reversed electronically in a misguided attempt to correct the mirror-image anatomy. Chest computed tomography scan obtained at the level of the origins of the great vessels in a 40-year-old man with situs inversus and dextrocardia. This image demonstrates mirror-image branching of the great vessels (*) and a left-sided superior vena cava (+). Chest computed tomography scan obtained at the level of the aortic outflow tract in a 40-year-old man with situs inversus and dextrocardia. This image shows reversal of the normal cardiac anatomy. The left atrium (LA), right atrium (RA), left ventricle (LV), and right ventricle (RV) are shown. The descending aorta (DA) is on the right. Computed tomography scan of the upper abdomen in a 40-year-old man with situs inversus and dextrocardia. This image shows reversal of the normal anatomy. 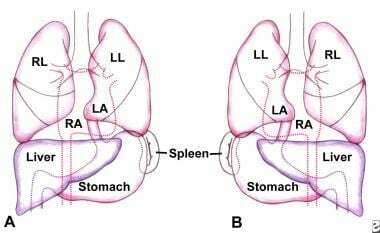 The spleen (SP), stomach (ST), and liver (L) are shown. The descending aorta (DA) is on the right. The degree of confidence with CT scanning is high. In preparing for CT scanning, the technologist records the patient's position—prone or supine—and whether the patient is moved into the scanner head first or feet first. If the orientation is specified incorrectly, the left-right orientation is displayed incorrectly, and situs inversus is simulated. The degree of confidence with MRI is high. As with CT scanning, if the technologist incorrectly records whether the patient is moved head first or feet first into the bore or whether the patient is prone or supine, the image is reversed, and incorrect situs anatomy is simulated. The degree of confidence with ultrasonography is high. Although it is possible to switch the left and right sides of the ultrasonographic displays by holding the transducer backwards or electronically reversing the image, this error is expected only with inexperienced users. False-positive or false-negative diagnoses with ultrasonography are unlikely. Any nuclear medicine study that is used to evaluate the heart or viscera can be influenced by the presence of situs inversus. These studies include cardiac, pulmonary, hepatobiliary, splenic, and gastrointestinal imaging. For example, on a ventilation-perfusion pulmonary scan, the photopenic defect from the heart is reversed in cases of situs inversus with dextrocardia. The technologist must be able to recognize situs inversus anatomy, because nonstandard camera positioning is often necessary for optimal imaging. The degree of confidence with most nuclear medicine studies is moderate because of the limited anatomic detail. Recording the anterior and posterior projections incorrectly reverses the left and right labeling. As with other digital images, the nuclear medicine image can be reversed electronically. Angiography is unnecessary for the diagnosis of situs inversus. In fact, noninvasive methods are preferred. Although the atrial morphology can be analyzed to determine atrial situs, angiography is usually reserved for the evaluation of congenital heart disease. The degree of confidence with angiography is high. The false-positive and false-negative angiographic findings are similar to those of fluoroscopy. Mujo T, Finnegan T, Joshi J, Wilcoxen KA, Reed JC. Situs ambiguous, levocardia, right sided stomach, obstructing duodenal web, and intestinal nonrotation: a case report. J Radiol Case Rep. 2015 Feb. 9 (2):16-23. [Medline]. [Full Text]. Lee SE, Kim HY, Jung SE, et al. Situs anomalies and gastrointestinal abnormalities. J Pediatr Surg. 2006 Jul. 41(7):1237-42. [Medline]. Maldjian PD, Saric M. Approach to dextrocardia in adults: review. AJR Am J Roentgenol. 2007 Jun. 188(6 suppl):S39-49; quiz S35-8. [Medline]. Gindes L, Hegesh J, Barkai G, Jacobson JM, Achiron R. Isolated levocardia: prenatal diagnosis, clinical importance, and literature review. J Ultrasound Med. 2007 Mar. 26(3):361-5. [Medline]. Fung TY, Chan DL, Leung TN, Leung TY, Lau TK. Dextrocardia in pregnancy: 20 years' experience. J Reprod Med. 2006 Jul. 51(7):573-7. [Medline]. Douglas YL, Jongbloed MR, den Hartog WC, Bartelings MM, Bogers AJ, Ebels T, et al. Pulmonary vein and atrial wall pathology in human total anomalous pulmonary venous connection. Int J Cardiol. 2008 Dec 29. [Medline]. Xu BP, Shen KL, Hu YH, Feng XL, Li HM, Lang ZQ. [Clinical characteristics of primary ciliary dyskinesia in children]. Zhonghua Er Ke Za Zhi. 2008 Aug. 46(8):618-22. [Medline]. Schrott-Fischer A, Rieger G, Morass B, Bitsche M, Horak E, Riechelmann H, et al. [Diagnostics of primary ciliary dyskinesia]. Laryngorhinootologie. 2008 Nov. 87(11):809-20; quiz 821-5. [Medline]. Van Mierop LH, Eisen S, Schiebler GL. The radiographic appearance of the tracheobronchial tree as an indicator of visceral situs. Am J Cardiol. 1970 Oct. 26(4):432-5. [Medline]. Palumbo E. [Neonatal diagnosis of primary ciliary dyskinesia. Recent advances]. Recenti Prog Med. 2008 Apr. 99(4):207-9. [Medline]. Knowles MR, Zariwala M, Leigh M. Primary Ciliary Dyskinesia. Clin Chest Med. 2016 Sep. 37 (3):449-61. [Medline]. [Full Text]. Liu Y, Wu L, Chen Y, Li D, Jiang J, Zhong W, et al. Delayed diagnosis of abdominal pain in patient with situs inversus totalis in emergency department: A case report. Medicine (Baltimore). 2017 Dec. 96 (49):e9028. [Medline]. [Full Text]. Applegate KE, Goske MJ, Pierce G, Murphy D. Situs revisited: imaging of the heterotaxy syndrome. Radiographics. 1999 Jul-Aug. 19(4):837-52; discussion 853-4. [Medline]. [Full Text]. Silverman NH. An ultrasonic approach to the diagnosis of cardiac situs, connections, and malpositions. Cardiol Clin. 1983 Aug. 1(3):473-86. [Medline]. Tonkin IL, Tonkin AK. Visceroatrial situs abnormalities: sonographic and computed tomographic appearance. AJR Am J Roentgenol. 1982 Mar. 138(3):509-15. [Medline]. [Full Text]. Partridge J. The radiological evaluation of atrial situs. Clin Radiol. 1979 Jan. 30(1):95-103. [Medline]. Kashiwagi S, Ishikawa T, Onoda N, Kawajiri H, Takashima T, Hirakawa K. Laparoscopic adrenalectomy in a patient with situs inversus. JSLS. 2013. 17(3):487-90. [Medline]. [Full Text]. Bartram U, Fischer G, Kramer HH. Congenitally interrupted inferior vena cava without other features of the heterotaxy syndrome: report of 5 cases and characterization of a rare entity. Pediatr Dev Pathol. 2007 Mar 22. 1 [epub ahead of print]. [Medline]. Yoo SJ, Kim YM, Choe YH. Magnetic resonance imaging of complex congenital heart disease. Int J Card Imaging. 1999 Apr. 15(2):151-60. [Medline]. Oui H, Kim J, Bae Y, Oh J, Park S, Lee G, et al. Computed Tomography Angiography of Situs Inversus, Portosystemic Shunt and Multiple Vena Cava Anomalies in a Dog. J Vet Med Sci. 2013 Jul 9. [Medline]. Rossi AC, Pluijmert M, Bovendeerd PH, Kroon W, Arts T, Delhaas T. Assessment and comparison of left ventricular shear in normal and situs inversus totalis hearts by means of magnetic resonance tagging. Am J Physiol Heart Circ Physiol. 2015 Mar 1. 308 (5):H416-23. [Medline]. Boland MR, Lowery AJ, Walsh S, Beddy D, Prichard RS, O'Shea D, et al. Incidental Phaeochromocytoma on Staging PET-CT in a Patient with a Sigmoid Tumour and Situs Inversalis Totalis. Case Rep Surg. 2014. 2014:645462. [Medline]. Sirin BH, Kurdal AT, Iskesen I. Congenitally corrected transposition of the great arteries plus dextrocardia operated with an unusual operative technique. Thorac Cardiovasc Surg. 2008 Sep. 56(6):367-9. [Medline]. Kouwenhoven JW, Bartels LW, Vincken KL, et al. The relation between organ anatomy and pre-existent vertebral rotation in the normal spine: magnetic resonance imaging study in humans with situs inversus totalis. Spine. 2007 May 1. 32(10):1123-8. [Medline]. Rumman N, Jackson C, Collins S, Goggin P, Coles J, Lucas JS. Diagnosis of primary ciliary dyskinesia: potential options for resource-limited countries. Eur Respir Rev. 2017 Jan. 26 (143):[Medline]. [Full Text]. Shapiro AJ, Zariwala MA, Ferkol T, Davis SD, Sagel SD, Dell SD, et al. Diagnosis, monitoring, and treatment of primary ciliary dyskinesia: PCD foundation consensus recommendations based on state of the art review. Pediatr Pulmonol. 2016 Feb. 51 (2):115-32. [Medline]. [Full Text].